13 September 2010, at 11:05a.m. UK - Increased mortality in a flock of 21-day old broilers caused by endocarditits was among the problems investigated by the Veterinary Laboratories Agency (VLA) and covered in its report for June 2010. Spotty liver syndrome was tentatively diagnosed in a flock of 27-week-old free-range layer hens submitted with a history of increase in mortality and slight drop in egg production. Post mortem examination revealed an enlarged and mottled liver from which bacterial cultures were sterile. Histopathological examination revealed lesions suggestive of bacterial infection. Acute caecal coccidiosis due to Eimeria tenella was seen in a flock of 27-day-old birds and a small flock of 42-day-old free-range birds. Post mortem examination revealed a haemorrhagic typhlitis with markedly dilated caecae containing fibrinous-haemorrhagic luminal casts. Wet smear examination of caecal contents revealed large numbers of oocyts and schizonts consistent in size and location with those of E tenella. Rickets was diagnosed in a flock of 27-day-old broilers with a history of poor growth and lameness. Post-mortem examination revealed poor bone strength affecting leg bones with linear widening of the growth plates and moderate enlargement of parathyroid glands. Histological examination of undecalcified sections of growth plates stained by Von Kossa's method confirmed mild osteodystrophic changes and patchy mineralisation failure consistent with rickets. Chronic spondylitis ('spinal abscess') was seen in two flocks of 42- and 47-day old broilers submitted with a history of lameness. Post mortem examination revealed a ventral swelling of the spine in the vicinity of the free thoracic vertebra T4. In the younger flock, bacterial cultures of material within the lesion produced good growth Enteroccoccus–like colonies whereas cultures in the older flock produced growths of E. coli. In addition septic arthritis due to Staphylococcus aureus was also diagnosed in some other birds. Increased mortality was reported, up to 45 birds per day, in a group of 14,000 21-day old broilers. Vegetative endocarditic lesions were identified in the right atrium/right ventricle of four birds examined and there was excess fluid in the pericardial sacs of nine birds examined. The lesions were found to be associated with Enterococcus hirae infection. This organism is more usually associated with encephalomalacia in very young birds but is also recognised as a cause of systemic disease, particularly endocarditis, in growing birds. Suspected rotavirus infection in two flocks aged eight or nine days was confirmed by PAGE (polyacrylamide gel electrophoresis). Clinical signs included increased mortality with wasting and poor condition. Findings at post mortem examination included dehydrated carcasses with fluid and colourless upper intestinal contents and dilated caeca with yellow frothy contents. Winchester investigated an outbreak of ocular disease affecting approximately 10 per cent of a group of 400 young partridges aged 2½ weeks. The clinical signs were of marked corneal opacity and suspect uveitis (Figure 1). Bacterial culture was carried out on an intra-ocular swab and yielded a very heavy pure growth of Pseudomonas aeruginosa, suggesting that infection with this organism was responsible for the ocular disease. 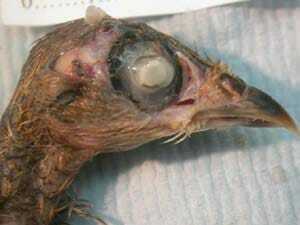 Pseudomonas aeruginosa has previously been reported as a cause of keratitis, keratoconjunctivitis and panophthalmitis in a variety of domesticated bird species including young gamebirds and turkeys. This is likely to represent an opportunist infection of environmental origin.